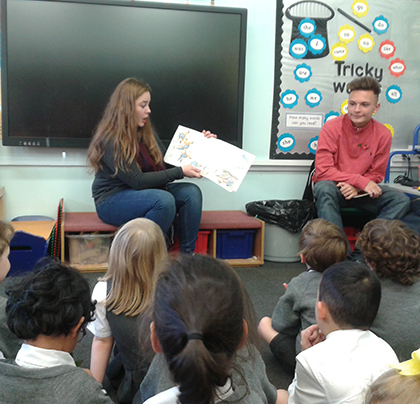 It was Jackanory time last week, as students from The Sixth Form College, Solihull visited St Alphege Junior and Infants School to deliver some dramatic story reading to the children. Budding actors from the College’s Theatre in Education enrichment programme took part in the visit to show the children in Reception and Years 1 and 2 what fun reading can be. Six students split into pairs and brought their acting skills to the fore to bring some popular children’s books to life. The first pair was Hannah Dacombe and Elise Fry, who read “No Matter What” by Debi Gliori and “Peter Pan” by J M Barrie. Jaden Carty and Gift Ogbebor formed another pair and they chose “The Proud and Fearless Lion” by Ann and Reg Cartwright and “The Gruffalo” by Julia Donaldson and Alex Scheffler. The final pair was Bartosz Markiewicz (Bart) and Karolina Hojda, who read “My Friend Bear” by Jez Alborough and “Coconut comes to school” by Berlie Doherty. Staff at St Alphege thanked the students for their time and praised them for engaging the children in reading. The students were also praised as “super role models for inspiring reading and making it fun and engaging”.